Definition at line 45 of file llnameeditor.h. Definition at line 49 of file llnameeditor.cpp. References LLUUID::isNull(), setNameID(), and sInstances. Definition at line 84 of file llnameeditor.cpp. Definition at line 156 of file llnameeditor.cpp. References LLViewBorder::BEVEL_IN, LLView::createRect(), FALSE, LLUICtrl::initFromXML(), LLNameEditor(), LLUUID::null, NULL, S32, LLView::selectFont(), LLLineEditor::setColorParameters(), LLLineEditor::setLabel(), LLViewBorder::STYLE_LINE, LLViewBorder::STYLE_TEXTURE, and LLStringBase< char >::toLower(). Definition at line 151 of file llnameeditor.cpp. Definition at line 79 of file llnameeditor.h. Definition at line 78 of file llnameeditor.h. Definition at line 115 of file llnameeditor.cpp. Definition at line 133 of file llnameeditor.cpp. Definition at line 89 of file llnameeditor.cpp. References DB_FIRST_NAME_BUF_SIZE, DB_GROUP_NAME_BUF_SIZE, DB_LAST_NAME_BUF_SIZE, first, gCacheName, LLCacheName::getGroupName(), LLCacheName::getName(), mNameID, and LLLineEditor::setText(). 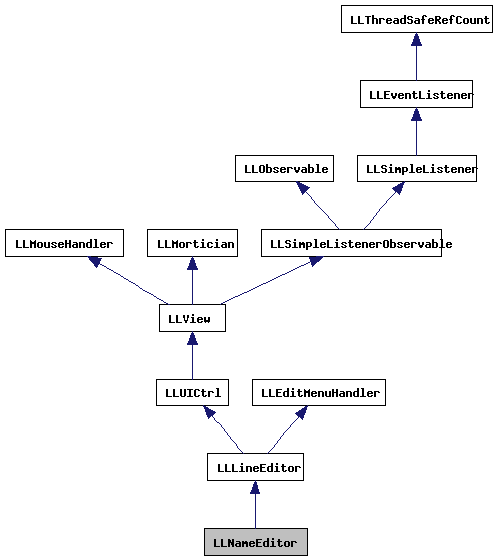 Referenced by LLNameEditor(), LLPanelAvatar::setAvatarID(), and setValue(). Definition at line 146 of file llnameeditor.cpp. References LLSD::asUUID(), FALSE, and setNameID(). Definition at line 89 of file llnameeditor.h. Referenced by getValue(), refresh(), and setNameID(). Definition at line 86 of file llnameeditor.h. 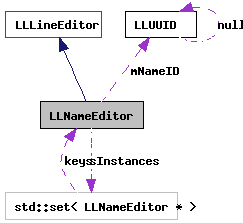 Referenced by LLNameEditor(), refreshAll(), and ~LLNameEditor().